The Daydream Developer options screen allows you to toggle advanced options for Daydream apps. These are similar to the Android developer options, but are a set of VR-specific developer options. These options help you profile and debug your app. They can also be used to enable experimental developer-only features. Use the menu icon to access Settings, then tap VR settings. Tap on the Build Version until a new Developer options item appears. Use the Daydream button to bring up the Dashboard and tap on the Settings icon. Open ALL SETTINGS. Go to Daydream and VR settings. Note: Developer options may be added and removed with new versions of Google VR Services. The specific options and default settings may also vary across supported Daydream devices. The screen will also flash red and log a warning every time asynchronous reprojection fails. This happens when the system is under heavy load and unable to render at the ideal frame rate. Display a black bar over the right eye to demonstrate motion-to-phone latency. Display a bar at the bottom of the screen that alternates between red and blue. This can be used for per-frame analysis when recording high-speed footage of your phone's display. The version of the library in Google VR Services. This library is dynamically loaded into Daydream apps and affects which features are enabled in that app. Toggles whether the SDK library is loaded from Google VR Services into Daydream apps at runtime. If disabled, the app will use the library that is in its APK which is normally older than the library inside Google VR Services. If disabled, pressing the Daydream button on the controller will launch Daydream Home instead of Daydream Dashboard. Daydream apps that are not compatible with WorldSense will not be rendered with positional tracking on headsets that have WorldSense. This option forces compatibility with WorldSense for all apps. Experimental feature to show 2D apps in VR. Warning: disabling safety graphics will disable the fog that prevents a user from moving too far from their starting location. This option should only be used in controlled environments where you can ensure user safety. Saves raw accelerometer, gyroscope, and magnetometer readings for your headset to /storage/emulated/0/Android/data/com.google.android.vr.home/cache/headtracking/. Shares an OpenGL Context between the applications render thread and the asynchronous reprojection thread. This improves performance on some devices but is unstable on other devices. Allows the use of a second phone with an emulator app instead of a real Daydream controller. This disables the Daydream button for certain apps. This setting is useful for running Daydream in "kiosk" mode where only a single app is allowed to run and the user is not allowed to launch other apps. When launching VR apps, this setting will skip standard checks such as headset compatibility or Daydream Controller updates. Allows recording of screenshots and videos using chords on the Daydream Controller. Pressing and holding Daydream + Volume Down will capture a screenshot. Pressing and holding Daydream + Volume Up will start and stop recording video. Warning: While this option is enabled, any application can record your VR session by launching the Intent. I RecorderService:   Use "adb shell am startservice -n com.google.vr.vrcore/.capture.record.RecorderService command [options]"
Enabling this allows modification of system Settings via adb. 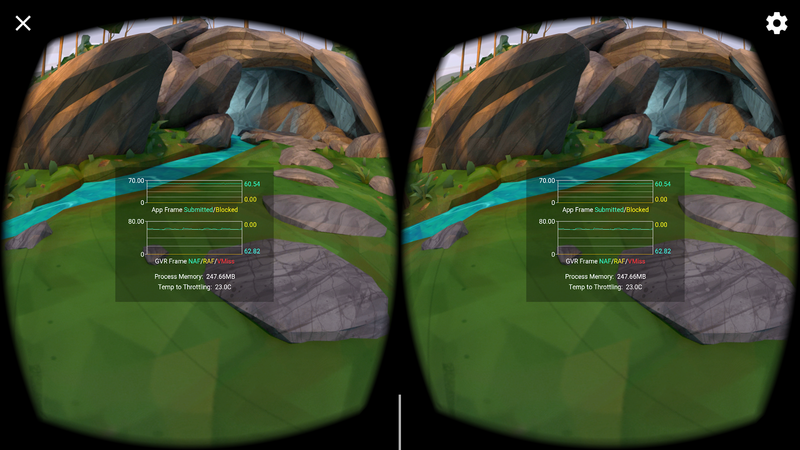 If 2D-in-VR is used, these settings can be used to configure the size of the virtual display. Width and height These affect the size of the virtual display that the app renders to. DPI This changes the dots per virtual inch used by the app to configure its layout. Scale This changes the size of the floating quad that contains the virtual display.